Lighweight yet boasting impressive sound, the iSport Superslim Bluetooth In-Ear Headphones have been designed to give you maximum comfort when active without compromising sound quality or performance. It is thenArgos' responsibility to inform you once your parcel has arrived and is ready for collection. Haven't receieved your item?. Box Contains. 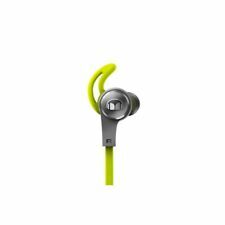 Monster iSport Achieve Wireless in-Ear Sweat-Proof Bluetooth Sport Headphones AFFORDABLE WIRELESS SPORTS AUDIO New to the iSport line, the Achieve still packs everything the iSport range stands for – comfort, durability, minimal weight and of course, awesome sound. And all at an unbelievable price. Discover iSport Achieve with wireless Bluetooth connectivity now. . Beats by dr. dre Monster Pro Headphones for DJ aluminium professional black. beats dr. dre sticker. User guide. carry case with draw cord toggle. Slight mark on bag as you can see from pics, but these have been lovingly cared for! 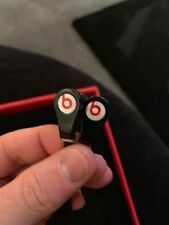 Genuine Monster Beats Tour by Dr Dre In Ear Headphones Earphones - with a case. Genuine Monster Beats Tour by Dr Dre In Ear Headphones Earphones - with a case. . Condition is Used. These are in good condition besides the cover for the inline volume control is missing. This doesn’t effect the way the headphones work, and the cover should be able to be bought from the manufacturer I would imagine. They sound great! They come with ear clips and the original case. Grab a bargain!! Thanks for looking and happy bidding. Monster Headphones. Amazing pure monster sound. Patented SportClip stays in your ear. Its advanced in-ear speaker and MicroStrand conductors turn your tunes into pure audio adrenaline.Features Only Authentic. Monster N-Pulse DJ wired Headphones. White or black headphones available. Monster iSport Strive In Ear Earphones Headphones with Mic - Black. Condition is Seller refurbished. Dispatched with Royal Mail 1st Class. Channel Islands, Isle of Wight, Isle of Man, Scilly Isles, Scottish Highlands, Scottish Islands and countries outside the UK. High-performance microphone for hands free calling. Tangle resistant cable. The Monster Clarity BT Designer Series high performance Bluetooth headphones are designed for the more discerning audiophile. Advanced Apt-X Bluetooth wireless. 24 hour battery life. At BoxedTech our team are comfortable being behind the scenes and letting our website do the talking. Mp3, Mp4, Cd Players, Radios, Pc. Monster High. Then we will ask you to send the item back. For Ages 4 . Plug 3.5mm Gold Plated. Frequency Response: 20hz ~ 20000hz. Power Handling Capacity: 80mw. Rated Power: 20mw. Original MONSTER BEATS WIRELESS by Dr Dre BLACK bluetooth Headphones. Complete with box and carry on case. Headphones are adjustable to size. Used yet in good condition, please note that the inline volume adjust button is missing (please see photo). Dispatched with Royal Mail 2nd class. Monster Beats by Dr Dre Studio Headphones (Black/Red) Hi-Def, Noise-Cancelling. Monster Beats by Dr. Dre Studio Headphones (Black/Red). Hi-Def, Noise-Cancelling, Over-Ear Headphones. Condition is Very Good, however the cushioning over the headband is showing signs of wear and has peeled away in places. Dispatched with eBay Shutl - delivery 2-3 days. This is for a pair of wireless, Bluetooth Monster iSport in ear earphones. I bought these and then shortly after got a daith piercing so could only use one ear they are practically new! Clearly didn’t think that through! Monster Clarity HD Headphones On-Ear Black The 137105-00 is also known as Monster Clarity designer series, these headphones come in retail packaging and offer great features such as (apt-X) built in mic for supremely clear calls play and pause functions and a fantastic long lasting battery life. Silicon padding won’t slip off your head Pivoting ear cups 20 days standby 30 hours talk time Ultra-soft ear cushions Over 24 hours at ample level Concealed adjustable headband Active echo suppression technology Low battery warning tone and light. Ex Display unit in very good condition. See photos to see condition and whats included. May have signs of being handled. In good condition and with accessories. Genuine Monster iSport Freedom On-Ear Wireless Bluetooth Headphones - Black. ISport Freedom is the mostadvanced, mostdurable headphone ever made forathletes. And it’swireless. No matter where yourworkout takes you, you can’t get any closer to themusic. This will provide you with a proof of receipt. Monster Voice Through™ allows you to hear your own voice naturally during calls. - Premium wireless Bluetooth sound quality at an incredible value. Lightweight materials, Ultra soft ear cushions and an ergonomically designed padded headband provide the maximum comfort for long listening sessions. Monster Clarity HD In-Ear Headphones with Microphone – Black. Monster Clarity HD In-Ear Headphones with Microphone. Trash those generic models and step up to Monster’s thoughtfully designed, incredible-sounding Clarity HD high-performance earbuds for an affordable, exceptionally comfortable and sonically superior high-definition audio experience. Product Description: The Monster Clarity Digital Direct high performance Bluetooth headphone packs cutting edge technology and premium features into a clean, modern design. Better Build: The highest quality materials and design are implemented-like the ultra-flexible headband, precision folding hinges, non-slip silicon head pad, for durable style and function Better Sound: The Monster Clarity Digital Direct offers Monsterous sound and 3 ways to listen; either wireless Bluetooth, wired analog, or future-ready digital direct audio. Bluetooth connectivity. Monster Performance Audio. Item is new, boxed, sealed an unopened. They are the slate black model. This was an unwanted gift. Pure Monster Sound and classic Monster design. Pure Monster Sound with advanced Bluetooth 4.0 apt-X. Step your workout up a little with Strive. 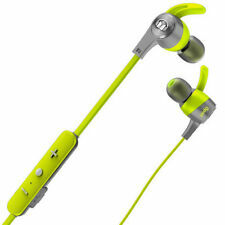 (If you want a wired sports headphone with more isolation, check out iSport Achieve or Compete). Stay tuned, stay fit with Strive. Pure Monster Sound while keeping you tuned in to your surroundings. Genuine iSport Achieve Wireless Bluetooth Headphones - Black. Music can drive you to higher levels of performance. Designed for the athlete, with slim design and strong, sweat-proof materials, the iSport Achieve stays fully secure, even during intense activities. The Monster headphones use a right angle L-jack to connect to a compatible device. The unit includes Pro Strain Relief that provides a rugged design to withstand heavy use. Dual in-ear buds on the Monster Turbine headphones isolate the ears from surrounding noises. Monster Clarity HD WHITE In-Ear Bluetooth Wireless Headphones. - Premium wireless Bluetooth sound quality at an incredible value. Monster Voice Through™ allows you to hear your own voice naturally during calls. Monster 's 24k over-ear DJ headphones get you as close to the sound as possible, unmatched in clarity and depth, hand-tuned with the precision to blow you away. It's your sound perfected by the experts at Monster. 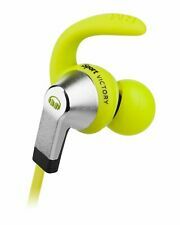 Monster MH ISRT VIC IE BK CU3 WW iSport Victory In-Ear Headphones. The Monster Turbines sound incredible, with any MP3 player. Monster Turbine Earphones. That’s why we had to call them speakers, not headphones. Monster EA SPORTS MVP Carbon On-Ear Headphones (White). Unlike most gaming headphones that are designed just for play, Monster Headphones are engineered for great gaming AND great music. Pure Monster Sound™ HDHS. In-ear headphones. Manufacturer MONSTER. Patented SportClip stays in your ear. Compatible with all smartphones. Features a microphone & remote. Monster iSport Victory In-Ear earphones pre owned in good working condition. Earphones only. Monster Voice Through™ allows you to hear your own voice naturally during calls. Premium wireless Bluetooth sound quality at an incredible value. - Premium wireless Bluetooth sound quality at an incredible value. Monster Clarity BT Designer Series HD Wireless Headphone in Silver. Monster Clarity HD Designer Series Silver Headphones. Active echo suppression technology. Superior wireless performance (apt-X). Low battery warning tone and light. Monster DNA Headband Headphones - Black/White. Used. In excellent condition. Headphones are working perfectly. Comes with headphones and connector cable. NOTHING ELSE. Manual and original case will not be provided. If earbuds aren't your thing but portability is, the NTune is just what you're looking for. The NTune is built to move. Monster Voice Through™ allows you to hear your own voice naturally during calls. Monster Clarity HD In-Ear Bluetooth Wireless Headphones. Premium wireless Bluetooth sound quality at an incredible value. Pure Monster Sound™. Flat tangle resistant cable. May still have old pricing stickers attached. Tangle-resistant cable design. Low mass, wide bandwidth driver for precision response. Music can drive you to higher levels of performance. Designed for the athlete, with slim design and strong, sweat-proof materials, the iSport Achieve stays fully secure, even during intense activities. 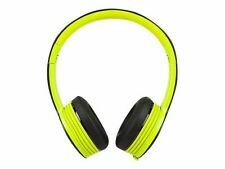 Monster iSport Freedom Wireless Bluetooth Headphones (Green). iSport Freedom, a wireless music and phone experience in a compact on-ear headphone design that will revolutionize your life. 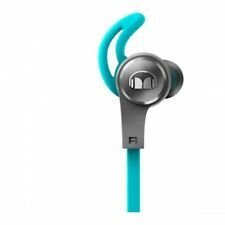 The Monster iSport headphones boast Bluetooth technology and work with all Bluetooth compatible devices.